Search.searchmpctpop.com is the PUP that uses misleading techniques to prevent removal. Use Reimage to locate malicious components and get rid of them faster than with uninstall instructions. A full system scan blocks virus reappearance and prevents traffic to malicious domains. Search.searchmpctpop.com is a browser hijacker that is presented as a legitimate Yahoo-based search engine. This potentially unwanted program (PUP) is created by Polarity Technologies and spreads as Convert That PDF extension. Just like the name of the tool suggests, this application allows converting documents directly from the main browser’s page. 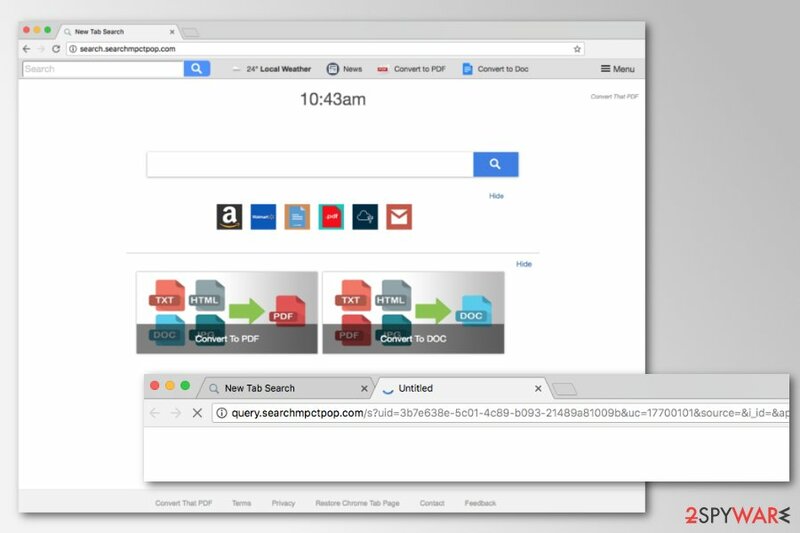 Search.searchmpctpop.com virus can hijack Google Chrome, Mozilla Firefox, Internet Explorer, and other popular search engines after incorrect installation of freeware or shareware. The PUP can alter systems settings, registry, and modify targeted browser’s shortcuts. inability to remove Search.searchmpctpop.com from the startup page. Search.searchmpctpop.com is a search engine that is used for marketing purposes. It might seem like a legit tool because it redirects search queries to Yahoo. However, these results are displayed via hijacked browser. Hence, the PUP might trigger redirects to third-party sites once you click one a needed search link. In this way websites increase traffic or might boost sales. Meanwhile, developers generate revenue from this activity. The similar profit model is used by displaying ads: when users click on the advertisements displayed by the hijacker, developers get pay-per-click revenue. However, users should beware of Search.searchmpctpop.com redirect problems that might occur when they use the hijacked browser. Links and ads might redirect to infected, tech support scam or phishing websites. Hence, it’s easy to get infected with malware or reveal sensitive information to cyber criminals. For this reason, Search.searchmpctpop.com should be completed immediately. We have already mentioned that it’s not a very simple task. It’s not enough to replace this domain with Google and save the changes. The hijacker is designed to reinstall itself after system reboot if users do not delete all hijacker-related components. To get rid of this shady search tool, you have to remove Convert That PDF extension as well as other suspicious programs, browser add-ons, and similar entries. You can do it by following the guide given below or opting for automatic elimination method with Reimage or another anti-malware tool. Search.searchmpctpop.com is advertised as a useful search engine. However, it's a browser hijacker. Browser hijacker cannot enter the system itself. It needs assistance and user’s permission to enter the system. Various freeware programs help the hijacker to spread. PUPs can be attached to any free program as “optional downloads.” When users install freeware using Recommended/Quick settings, they give indirect permission for PUPs to get into the system as well. The problem is Recommended settings which are popular among computer users. 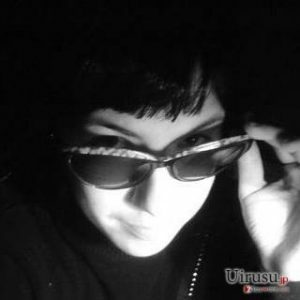 Researchers from LesVirus.fr note that users are not aware that third-party apps can be installed silently without asking their permission. However, users can avoid installing PUPs if they use Advanced/Custom settings. They reveal about additional programs and allow rejecting their installation. To remove Search.searchmpctpop.com from the homepage, you need to get rid of browser extensions, programs, and files that are related to the browser hijacker. The guidelines below will show how to perform this task properly. However, we suggest opting for quicker solution – automatic Search.searchmpctpop.com removal. It requires running a full system scan with an updated anti-malware/anti-spyware software and resetting affected browsers. Here, look for Search.searchmpctpop.com or any other recently installed suspicious programs. Wait until you see Applications folder and look for Search.searchmpctpop.com or any other suspicious programs on it. Now right click on every of such entries and select Move to Trash. When in the new window, check Delete personal settings and select Reset again to complete Search.searchmpctpop.com removal. Once these steps are finished, Search.searchmpctpop.com should be removed from your Microsoft Edge browser. Here, select Search.searchmpctpop.com and other questionable plugins. Click Remove to delete these entries. Now you will see Reset Firefox to its default state message with Reset Firefox button. Click this button for several times and complete Search.searchmpctpop.com removal. Here, select Search.searchmpctpop.com and other malicious plugins and select trash icon to delete these entries. Click Reset to confirm this action and complete Search.searchmpctpop.com removal. Here, select Extensions and look for Search.searchmpctpop.com or other suspicious entries. Click on the Uninstall button to get rid each of them. Here, look at the Homepage field. If it was altered by Search.searchmpctpop.com, remove unwanted link and enter the one that you want to use for your searches. Remember to include the "http://" before typing in the address of the page. Now you will see a detailed dialog window filled with reset options. All of those options are usually checked, but you can specify which of them you want to reset. 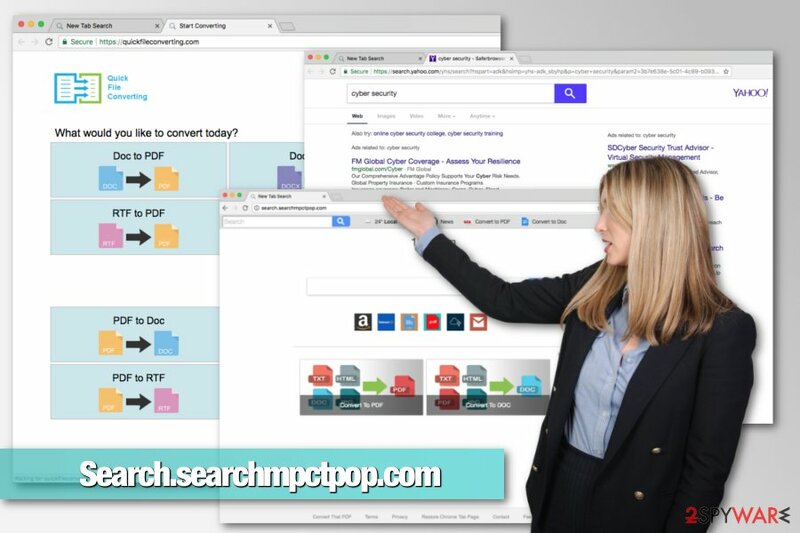 Click the Reset button to complete Search.searchmpctpop.com removal process. ^ Chris Hoffman. PUPs Explained: What is a “Potentially Unwanted Program”?. How-to Geek. The website about technology. This entry was posted on 2018-03-21 at 04:01 and is filed under Stealing programs, Viruses. You can quickly scan the QR code with your mobile device and have Search.searchmpctpop.com manual removal instructions right in your pocket. How did you remove Search.searchmpctpop.com?